Do you have your aromatherapy notes in one place and your blending notes in another? Do you make essential oil blends and perfumes you or your friends love but can’t replicate because you forgot to record the oils you used and how many drops of each? Do you know how much it’s costing you to give away free samples? Do you keep an eye on approaching expiry dates of your essential oils, vegetable oils, hydrosols, creams, etc.? Would you like to be able to keep all this information in one place either on your computer or in an A4 binder? In addition to the journal below that you can print and fill in manually you also receive digital files that you can download and fill out in your computer. You can save this information and add to it anytime. If you want to go paperless this is the ideal solution. 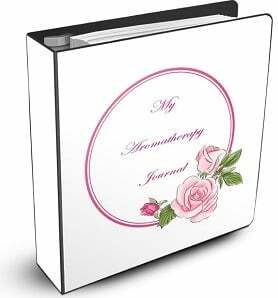 “My Aromatherapy Journal” is a PDF that will help you keep all this information safely in an A4 binder. The journal contains 30 pages for you to record the botanical name, information about the plant, tree or flower from which the essential oil comes, how it is distilled, and its therapeutic, emotional, mental and spiritual properties. There is space for documenting any safety issues and extra information. In addition you will find space for adding a photo or sketch of the plant. Eleven pages are set up for recording the essential oils, carrier oils or hydrosols used in the blend and their cost. I provided space for the containers used and labels as well as your time investment. This makes it easy to cost your products. You may wish to record instructions given and any comments, either your own or from clients. Two more pages are found at the back of the PDF if needed. I provide a separate page with formulae designed to help you with costing your individual essential oils by ml and drops. Handy dilution guidelines are included for your consideration. In the inventory section you will find individual pages dedicated to your essential oils, vegetable oils, hydrosols etc. and containers. Here you record date of purchase, the supplier, the cost and expiry date. 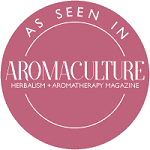 In the reference section you will be able to keep note of your aromatherapy books and their authors, articles and websites you may want to refer to and any classes you have taken and your thoughts on them. In the final section you will find ‘Note’ pages you can download should you need more space for listing additional information on essential oils and blending. Finally there are divider pages you can laminate or paste to dividers to mark each section, making it easy to find. For a personal touch I included a “this journal belongs to…” page. This downloadable journal contains a total of 76 pages. It allows you to fill in your information, setting up an easily accessible record of all your formulas and anything related to your studying and blending activities. Please note as this is a digital product your payment is non-refundable.